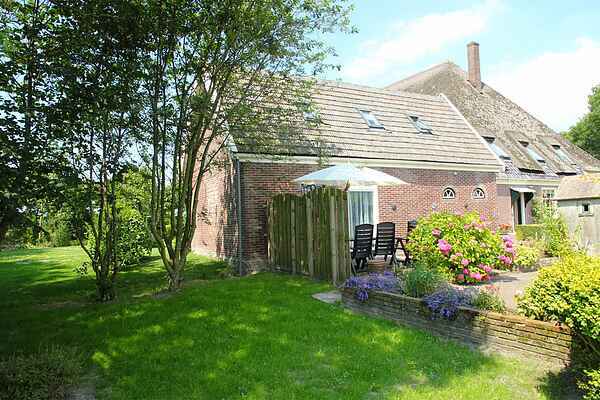 This picturesque 'polder house' is situated in the middle of the polder of North Holland behind a monumental haubarg. In the village of Oude Sluis, humans have prevailed over nature. Now there's land but once this was sea. It's a twenty-minute bike ride to the city of Schagen. The polder house has the atmosphere of a wooden chalet by the sea: authentic and cosy but still modern. Beautiful wooden beams decorate the ceiling. The inside of the cosy bedroom looks like German timber framing, the light pouring in through the semicircular window. The ground floor has a bathroom with a bright red bathtub. In the summer, you can plunge into the cool swimming pool. During the other seasons, you can enjoy the sea air on the large grounds behind the owners' farmhouse. Children can romp around and play on the climbing frames and swing. You're right by the Grote Sluys and the 17th-century lockkeeper's house, and you can bike to the beach at Callantsoog in 30 minutes.